The Queen and senior royals attended a remembrance concert at the Royal Albert Hall on the eve of Armistice Day. The annual Festival of Remembrance in London, which commemorates the war dead, included performances from Sir Tom Jones and Sheridan Smith. It came ahead of Remembrance Sunday on 11 November, which this year marks 100 years since the end of World War One. The dukes and duchesses of Cambridge and Sussex, and Prime Minister Theresa May were among the audience. The royals stood as thousands of people in the audience held up photos of World War One soldiers - including Mrs May and husband Philip who held pictures of two of her ancestors. Poppies fell from the ceiling of the iconic venue, after the Last Post was played. And the royals gave a standing ovation to Chelsea Pensioners and bereaved family members who walked onto the stage. The event was organised by armed forces charity the Royal British Legion as a "thank you to all who served, sacrificed and changed our world". It was later broadcast on BBC One. The concert saw performances from Welsh singer Bryn Terfel, who sang Amazing Grace, as well as former McFly stars Tom Fletcher and Danny Jones who sang a song written to celebrate the RAF centenary. Sheridan Smith sang Are You Just Sleeping, while British cellist Sheku Kanneh-Mason - who won BBC Young Musician of the Year in 2016 - played a version of Hallelujah by Leonard Cohen. The Kingdom Choir, who performed at Prince Harry and Meghan's wedding, sang a version of the Lord's Prayer. The audience clapped as members of the Armed Forces marched into the centre of the venue and gathered in formation. 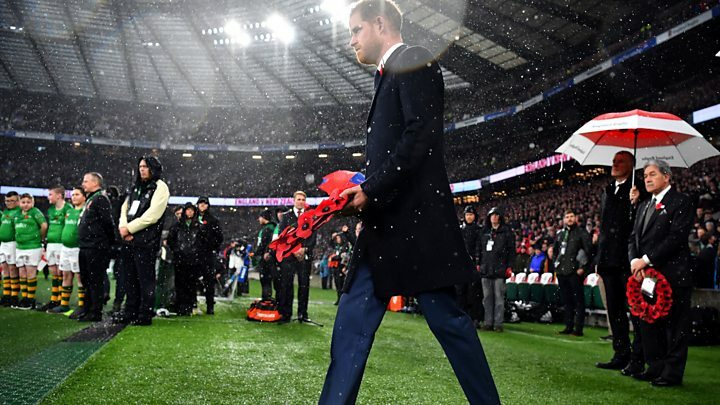 Earlier, the Duke of Sussex laid a wreath at Twickenham ahead of England's rugby Test match against New Zealand. Prince Harry was joined by New Zealand deputy prime minister Winston Peters to lay their wreaths, before the Last Post was played and spectators joined in a minute's silence. The concert comes as French President Emmanuel Macron and Germany's Chancellor Angela Merkel visited the town of Compiègne in northern France, where the Allies and Germany signed the Armistice. On Friday, Mrs May visited Belgium with the country's prime minister and laid wreaths at the graves of the first and last UK soldiers killed in the war. Poppy displays have been created across the country, including in a street dubbed "Poppy Road" in Walsall and at Hertford Castle. In the UK, pipers across the country will begin the commemorations at 06:00 with "Battle's O'er" - a traditional Scottish lament played at the end of battle. The Queen and senior royals will attend London's Cenotaph for the national remembrance service at 11:00 GMT. London's Big Ben will also strike at 11:00, as the ongoing renovation work has been temporarily suspended for Remembrance Sunday. White poppy: How is it different from the red remembrance symbol?